Our Fans in eBA on Facebook frequently suggest us to enrich our eBA Group Sites with social features which instantly awakens and strengthens the great community that visits our sites ! Thereby we are now letting our visitors discover each other by joining our "eBA Friends Corner" site ( on the right column of the eBA Portal ) with existing accounts from a variety of services, as Google, Yahoo, Twitter, AOL, orkut y Plaxo, enforcing our existing community. Men's Basketball HoopScoop is a basketball coaching trading website, managed by Coach Scott Peterman. 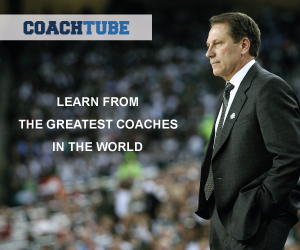 He tell us "... We have over 2500 coaching clinic notes on basketball coaching that are available to you for free. If we don't have it then we will post something on our website and we can find it in 48 hours. The site is managed by Coach Scott Peterman. The Men's Basketball HoopScoop, is a Recommended Site by the eBA Stats Group. This group is for coaches from across the world to exchange information, ideas and knowledge about basketball. Strategy, motivation, discipline, books, videos, "how to"... you can discuss it all here. No age group is too young, no idea is too basic. Coaches can receive individual e-mails or one daily summary e-mail (daily digest). This community presently have coaches from all levels, youth to professional. The group is moderated by Coach Larry Ronglien. The Coaching Hoops @ Yahoo Groups Coaching Hoops e-mail discussion group - click here, is a Recommended Site by eBA-Stats.com. Discuss ideas on basketball coaching: Offenses, defenses, drills,strategy... Members can also access the group chatroom for open forums on basketball coaching. Coaches can receive individual e-mails or one daily summary e-mail (daily digest). This community presently have coaches from all levels, youth to professional. The group is moderated by Admiral Farragut boys Basketball coach Mike Wells, who won a state title during the 2003-04 season. The Basketball Coaching @ Yahoo Groups Basketball Coaching e-mail discussion group - click here, is a Recommended Site by eBA-Stats.com.